This system views body movement from a scientific vantage point, and judges whether a technique or method is efficient or inefficient, not based on some category of which is "the best" in any given style. Instead, it is judged in terms of scientific pragmatism, the knowledge of balance, coordination, and body alignment, so that the student may safely deliver a strike while simultaneously maximizing his or her focus on optimum power. Martial Arts is a physical activity and as a result is governed by the various physical laws and principles that regulate the world of nature, such as the laws found in Newtonian physics. 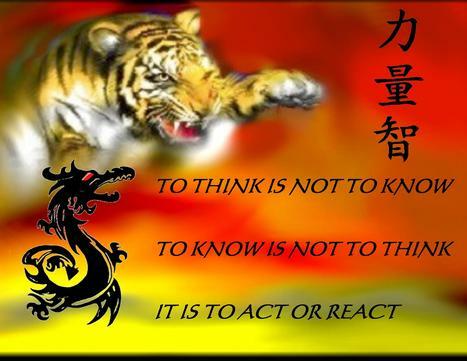 By virtue of this, every individual will become a better martial artist when they learn to train scientifically. This does not require studying different arts, but rather a study of the human sciences of mechanics, dynamics and physiology. Sandokan will provide the practitioner a solid comprehension of all pressure points and joint manipulation of the body. This system employs triangular yet linier foot work to achieve a strong anatomical foundation. To learn this system is to comprehend how the body works offensively and defensively using the body's anatomy and physics and the optimum learning tool. It is a complete system on it's own or a perfect enhancement to any other style or system. This system has its own bladed weapons, designed specifically using the physics of anatomy. The weapons are designed to be an anatomical extension of the practitioners hand, maximizing linier positioning. ​Level 1 Foot work, body positioning, throws, falls and thrusts. Form 1 Bladed and slashes. Level 2 Continued level one, linear and triangular footwork. Form 2 Double and single blade, short sword with empty hand application and patterns of movement. Level 3 Continued level one and two, full throws, locks, breaks, disarms. Form 3 Emphasis on cutting and thrusting. Level 4 Continued level one, two and three, full joint manipulation with comprehension of positioning, footwork and body balance. Form 4 Adjustments, short sword fighting techniques. Level 5 Testing of all levels and forms – achieving black belt. Form 5 All levels are composed of combat drills and skills. The Sandokan system comprises an understanding of martial science, biomechanics, gravity and how the human body works, functions and reacts. Sandokan is a result of direct application of research and experience into human sciences of motion, force production, fitness, conditioning, kinesiology, physiology and physics.